I’ve had these mittens done for more than a week now, but with finals grading I didn’t have time to photograph and post them—so finally, here are my owl mittens! 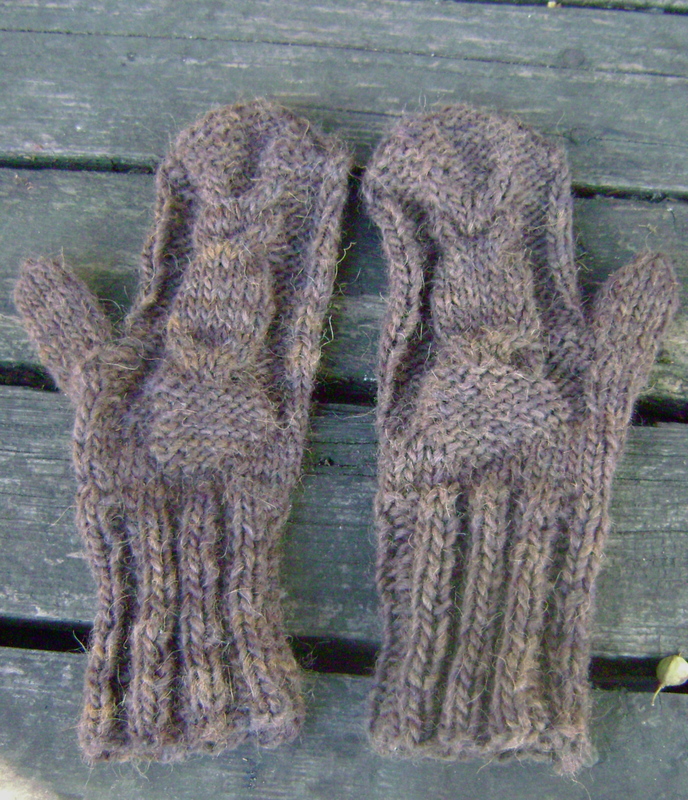 These are my version of the Give a Hoot owl mittens, from a free pattern I found on Ravelry. I know they’re unblocked and without eyes, but that hasn’t stopped me from wearing them and enjoying them. They are just what I needed for riding my bike to and from campus! The sizing came out perfect too, and after a mini-crisis where I lost the second ball from the matching dye lot of this yarn, all went pretty well. 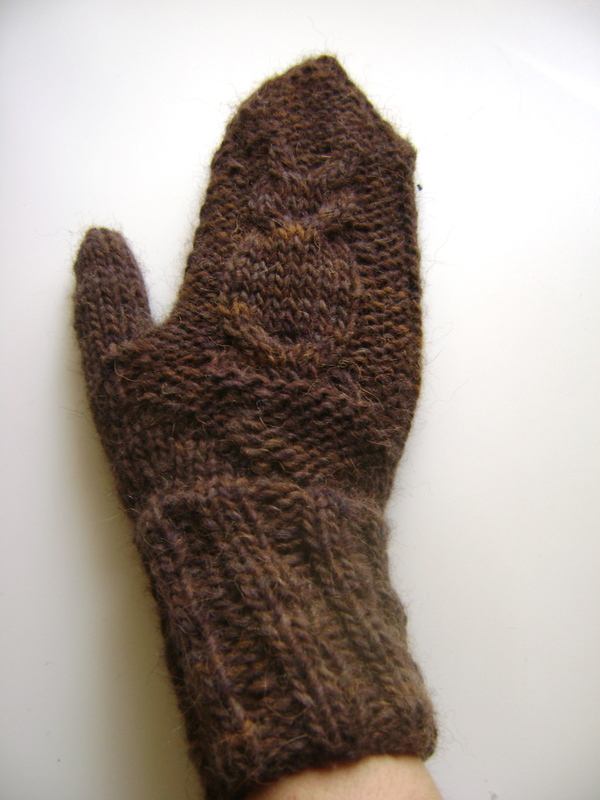 However, doing this project reminded me about something very important: the challenges of left-handed knitting! And all of this reminded me about something I often take for granted: if you knit left-handed, you always have to be prepared for weird knitting issues. 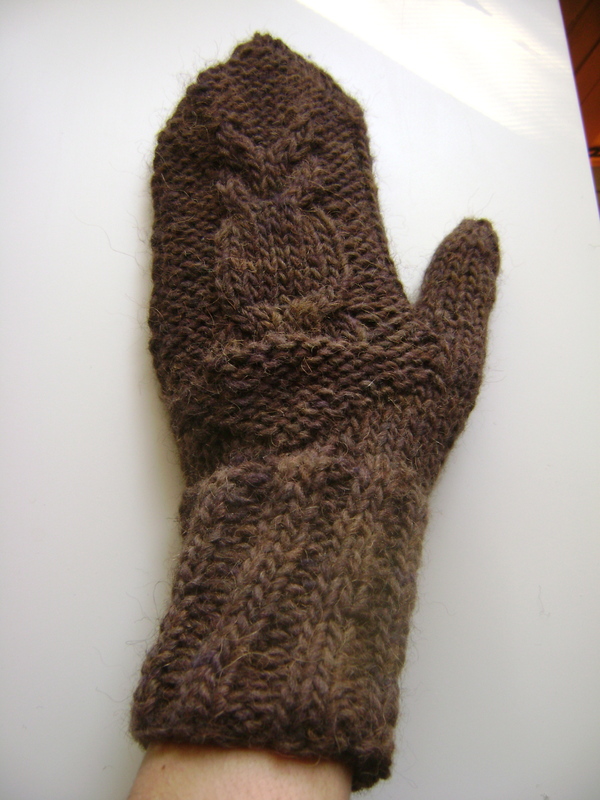 While I doubt there are many lefty knitters out there reading this, I thought I might use this post to provide what tips and tricks I know about how to knit left handed. First of all let me say that I am no expert knitter. I just happen to knit the opposite way of most people—when I start a row, all my stitches are on the right needle, and I work them using my left needle. 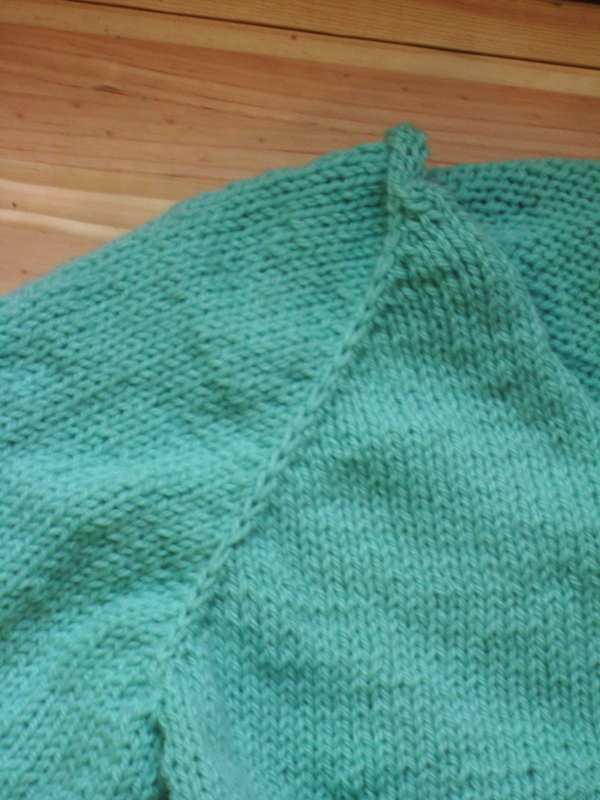 I knit English style (I “throw the yarn” over the needle) and I know that some people consider Continental or European style knitting to be “left-handed” in some respects, but I can’t really speak to that (I tried it, but couldn’t get the purling motion down). What I have learned is that if you knit like me, you must keep one key thing in mind things in mind if you want to knit left-handed with any kind of success: directionality. By directionality, I just mean this: how much does it matter if you reverse the direction of knitting in a particular pattern? A lot of patterns are symmetrical, where the direction you knit won’t really matter. But when it matters, it really matters! Round 1: K3, K1f&b, K15, P4, K5 – 29 sts. Round 2: K4, K1f&b, K14, P6, K4 – 30 sts. Round 3: K5, K1f&b, K13, P8, K3 – 31 sts. Round 4: K6, K1f&b, K12, P10, K2 – 32 sts. Notice the bolded parts. If you knit right handed, you will be moving your stitches clockwise (from the needle in your left hand to the needle in your right) as you knit these rounds. So in each round you’ll knit just a few stitches in this direction, then you’ll add a stitch (k f&b), then you’ll go all the way around the tube of knitting without increasing again, coming back to your starting point. Doing this, your increases will all ended up on the Left side of your knitting. But if you knit left-handed, you will be moving your stitches counterclockwise (from the needle in your right hand to the needle in your left) as you knit these rounds—so your increases will end up on the Right side of your knitted tube! Now, lest you think, oh well, I’ll just wear the mittens with the top side down and that will fix the problem—remember, there’s an owl on the top of this pattern! You will ended up wearing the owl on the palm of your hand that way. 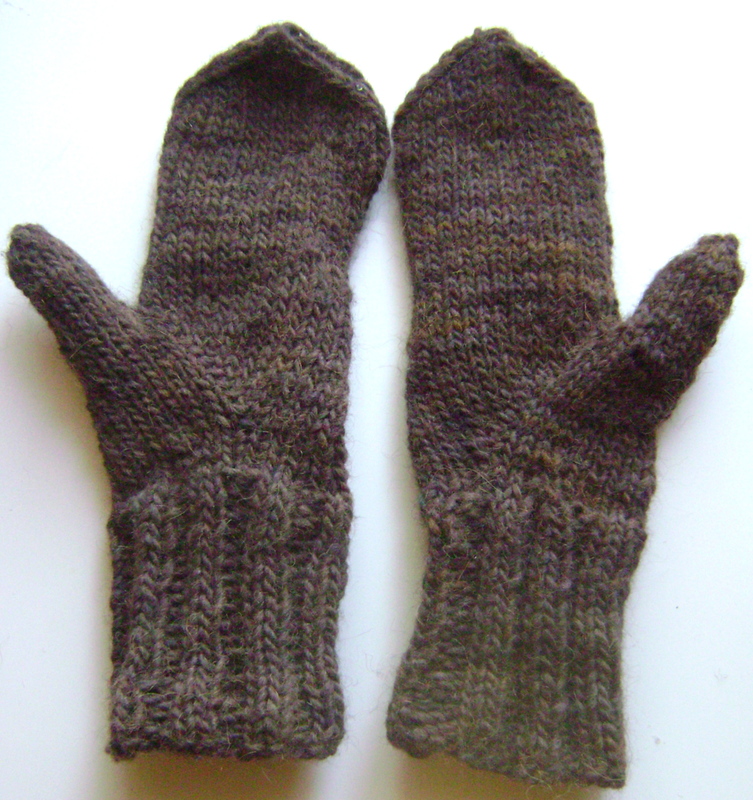 It’s much easier to wear the “Left” mitten on your right hand and vice versa. Otherwise, you have to have to move the entire owl pattern to the other side of the mitten (and since those purl stitches you see above are part of the own pattern, you’ll have to start altering the pattern as you’re making those increases—and I’m pretty sure that would be obnoxious). Finally I realized that since they were left- and right-leaning increases, they had directionality—as in, they slant in the direction of the sleeves, so doing what patterns said would be backwards. Everything seemed to recommend doing KRL then KLL. But that’s if you are knitting your sweater clockwise. I tried doing KLL then KRL and suddenly, it worked fine! I’m actually kinda surprised that there isn’t more out there for lefty knitters. I can’t find the website I once used to look things up. But I have a few suggestions. For beginners, I recommend watching a video on how to knit left-handed. I found some videos that knit in a variety of left-handed adaptations as far as which leg of the loop to knit into and which direction to wrap your yarn, so I’m sure you can find someone doing it “your way.” This youtube video is how I do it, and it includes casting on, knitting and binding off. While it doesn’t have any audio explanation, I think it is a very clear visual of what your hands should do (you can turn off the audio if the music annoys you). Only downside is that it doesn’t show you how to purl—but there is another video for that. For southpaw knitters who already know the basics, I like the Knitty article “Knitting in the Mirror” for its general discussion of left-handed knitting issues. However, the article is old (2003) and almost all of the links in it are dead. If any of this helped you out or you have another questions about left handed knitting (or crocheting or spinning for that matter! ), feel free to leave a comment. This post is exactly what I needed. I am in fact knitting owl mittens and was concerned about the direction my cables would go but then realized knitting lefty the right hand would be my left hand mitten and vice versa. I can live with that. I think your post confirms my suspicion. 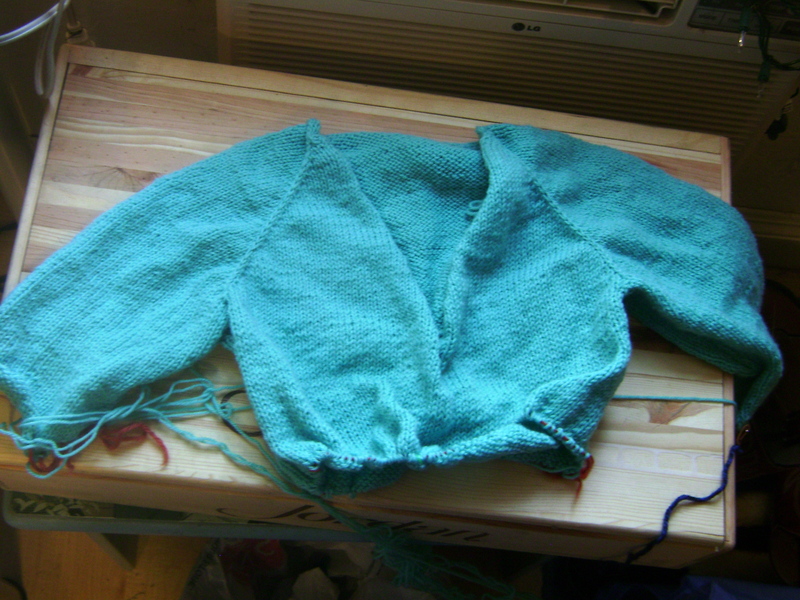 Also, I have yet to knit a sweater because I was wondering about decreases. You pretty much summed up what I was thinking. Left hand tutorials I love are Bill Souza. He seemed to have dropped off the planet but his archived videos are very helpful. Thanks again for this great post! You’re welcome! There aren’t that many of us lefty knitters out there, we need all the tips we can get.